Dynamic Securities Analytics, Inc. (“DSA”) reviewed the SEC’s and FINRA‘s 2017 exam priorities letters to identify AML areas of focus. There are a few areas where the two regulators’ priorities overlap: suspicious activity monitoring, cyber security and elder financial exploitation. The focus on elder abuse is a new area for the SEC this year whereas FINRA had included it in 2016. Securities firms got the message on the importance of detecting elder abuse as witnessed by the 26% increase in SAR filings in 2016 on Elder Financial Exploitation. FINRA added four other areas that touch on AML issues: foreign currency transactions, transactions that flow through suspense accounts, nominee accounts/transaction and fixed income market manipulation. 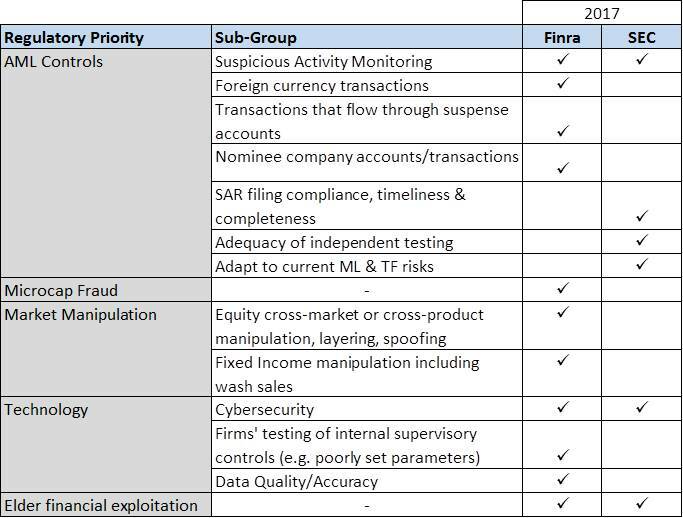 Equally interesting is that “Culture of Compliance” was nowhere to be found in FINRA’s 2017 priorities. The SEC dropped a few of its 2016 priorities including SAR quantity (no/low SAR filings by BDs), microcap fraud and market manipulation. Perhaps the SEC removed microcap fraud and market manipulation due to the SEC’s move towards greater oversight of Investment Advisors and increased reliance on FINRA for the oversight of BDs. The SEC shifted towards reviewing the quality not the quantity of SARs filed in its 2017 letter by focusing on the “timeliness and completeness of SARs filed.” DSA pointed out the conflicts inherent in demanding that every BD file atleast one SAR in our post “Why 35% of BDs File Zero SARs” perhaps the SEC took note. DSA also analyzed 2016 SAR-SF filings to determine which Suspicious Activity Types saw the largest increases and decreases in filings. As noted above, elder exploitation saw an increase in filings of 26% over 2015 levels. The largest increase was seen in “Unregistered or Unlicensed MSB” with an increase of 211%. Market manipulation/wash trading SAR filings decreased 36% despite being a priority area for both FINRA and the SEC in 2016. Overall SAR-SF filings dropped 8.8% in 2016 despite the SEC’s 2016 low/no SAR exam priority. Comparatively, SAR filings across all industries increased 9.6% in 2016. Click here to see interactive 2016 SAR analytics for all industries. 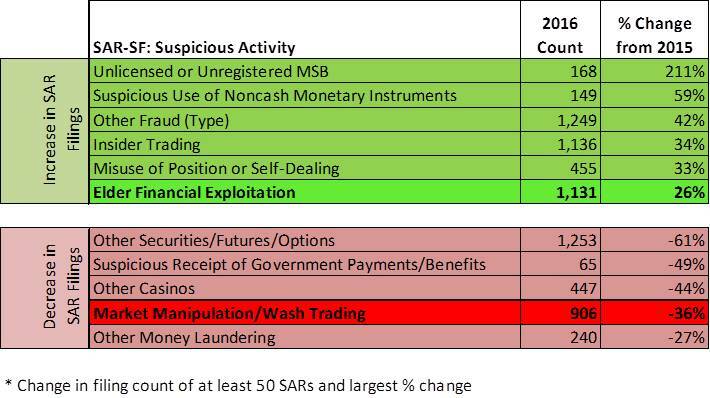 SAR data source: FinCEN SAR Stas from Jan-Oct 2016. SAR analytics: Dynamic Securities Analytics, Inc.
← 2016 SAR Insights: Suitcases of Cash No Longer the Front-Runner in Public Corruption.